Thread is built by eXpd8, an Irish company with over 30 years' experience helping lawyers run their practices more efficiently. In this time we've served as an IT partner to over 500 firms worldwide. We pride ourselves on our close relationships with our users and it is in consultation with them that we have designed a cloud-based legal practice management product for the modern lawyer. Declan is a serial entrepreneur and well-known businessman, with extensive experience within the legal software market. Declan has founded several businesses including eXpd8 Ltd., which provides legal software and support services to customers worldwide. Declan grew the business as CEO from a start-up to a successful and well-established company. Declan founded Thread Legal after he saw a gap in the market for a legal software that could keep up with new advances in technology, and utilise the latest innovations in a way that provides tangible efficiency savings and increased customer satisfaction for lawyers. It is Declan’s vision that has driven the development of Thread Legal, and he is looking forward to seeing the impact that it is already having and will continue to have on future-focussed law firms. Liam is an experienced Director, who has led multiple software companies through accelerated growth periods and on to regional and global success. Most recently, Liam was CEO of Sage Ireland, which he took from an unknown newcomer to the country’s leading business management software. This was achieved through setting up a multi-channel sales model to facilitate organic growth, and through effective acquisitions. He has also held senior executive positions with Siemens Computer Systems and VersAccounts. Liam joined Thread Legal to manage their growth strategy, engage with legal audiences worldwide and to build a strong leadership team capable of driving his vision forward. In his spare time, Liam acts as a business advisor and mentor to other Irish start-up owners, helping them to optimise their growth strategies and avoid many of the potential issues associated with a new venture. Sabina has over twelve years’ experience with helping legal professionals find the best solutions with which to run their practices. This has given her a unique insight into the workflows and processes of law firms around the globe. Sabina joined Thread Legal to oversee their global expansion, and manages a team of Country Managers in several key regions. Sabina is known for her empathy with clients, and ability to help them design solutions that enhance their business operations and improve both employee and customer satisfaction. She has helped many companies avoid the common pitfalls associated with implementing new software systems and embrace technology within their business. Lyn is the Head of Operations, managing the processes that ensure our business provides the most effective service possible to clients and to partners. Lyn has implemented tools to digitise Thread Legal’s offices while optimising the latest business and process management technologies. A buyer by trade, Lyn is an expert in product commercialisation, and putting in place the systems required for a product to be successful in a target market. She spent many years managing product launches for a global brand, and is using this experience to leverage and support Thread Legal’s operations as they scale. Joanna worked directly with rapidly scaling start-ups and the investment community for a number of years, and has a hands-on understanding of what it takes to grow a successful organisation. Joanna and her team manage the marketing activities for Thread Legal across several key global territories, as well as working on a number of central marketing projects within the business. Eoin is an experienced Head of Development, having worked as a Lead Developer on legal software for over fifteen years before moving to the Head of Development role. Eoin in an expert in cloud technology, and has been the lead in incorporating many of the latest innovations such as Artificial Intelligence into the Thread Legal product. He also effectively applies modern software development techniques in order to create an agile development model that can turn around new features in a matter of weeks rather than months. 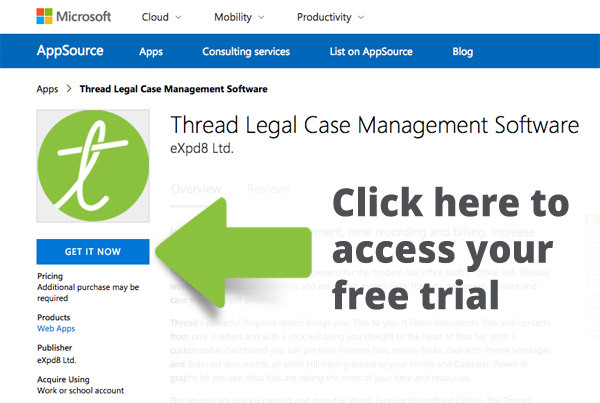 Time to start sharing Thread with lawyers, solicitors and barristers around the world! So far in 2018 we have launched in the UK, South Africa and Singapore and are growing rapidly. Keep watching this space. After 12 months of brain storming, debates, research, and a few visits with the Architects at Microsoft, Thread was born! The latest technology shaped to meet the needs of the legal industry. We officially launched in North and South Carolina in September. We developed a design for a new case management solution. We asked our clients what they wanted, we put together a hardy team of Developers and threw the kitchen sink at them. And so the journey began! Our existing system, eXpd8, was loved and selling strong in Ireland, but we wanted to do more. Over a game of golf, in Portmarnock, Co. Dublin, our CEO Liam Mullaney, and Founder Declan Branagan, had a thought – what is this thing called The Cloud and how could we harness it? With over 500 clients and 2000 users of the software worldwide, it was clear that we were doing something right! The sleek design and functionality of eXpd8 made it the software of choice for Irish legal firms. eXpd8 Ltd, based in Dublin, Ireland was established to provide end to end IT solutions to the legal sector. Our Founder Declan Branagan soon recognised a gap in the market to help legal firms be more productive. With a small team and a big vision the eXpd8 legal case management software was set in motion.